My twelve year-old granddaughter is a very positive and happy person. She wants to talk and hear about positive things. At times I understand that she is simply naïve but I appreciate the fact that she has a positive outlook and wants to see the best in everything and everyone. And she tries very hard to be the best person she can be. Recently I heard a response to the question of why the news media seem to always report only “bad” things. The reason given was because “bad news” is not the norm. There are far more stories of “good news.” The exception to the rule makes something newsworthy. Therefore tragedy, hostility, and other unseemly attitudes, words, and acts are reported because they are the exceptions. I am not sure that is actually the reality but it is one perspective and possibility. One of my teachers had a saying that bad news goes around the world twice before good news gets its shoes on. It certainly does seem that bad news travels faster than good news. Word of a robbery seems to spread much farther and faster than a report of a random act of kindness. Road rage makes the headlines but the many motorists who are patient and tolerant are seemingly absent. I am often reminded that we see and hear what we are looking and listening for. Our ears perk up at juicy gossip and our eyes widen when we see something unseemly. Today as I was driving I saw blue lights flashing in the distance. Instinctively I slowed down and expected to see an accident or someone receiving a ticket for violating the traffic laws. Maybe even a person being arrested for some criminal act. But I saw something very different. Two police vehicles were diverting traffic around a stalled minivan and two officers were changing a flat tire for the driver of the stranded automobile. That was a surprise but a welcome sight. The officers were white and the motorist was black. The officers were male and the driver was female. There are so many reports these days about white law enforcement officers inflicting violence on black citizens and headlines about men exploiting women. Nothing that I say here is intended to make light of these incidents. Violence against any human being is never justified and is even more detestable when it comes from persons in authority or from racist and/or sexist attitudes. 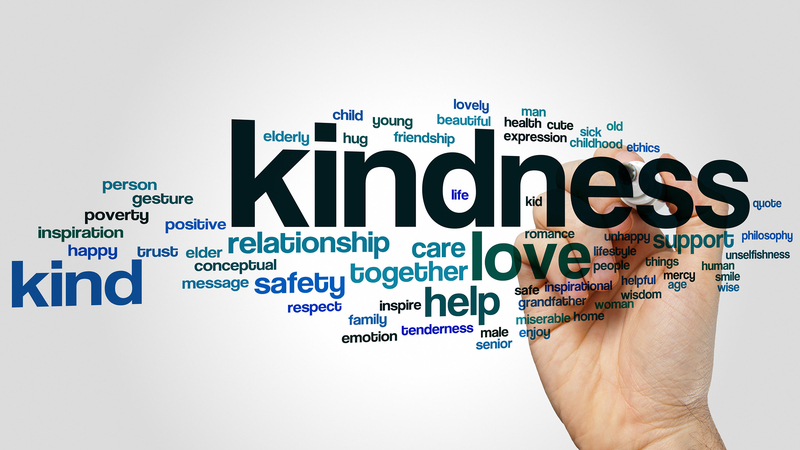 The experience I am reporting is meant simply to remind us that acts of kindness, generosity, gentleness, mercy, and respect occur all the time. We must not allow the “exceptions,” as horrible as they are, to lead us to believe that civility and human dignity have disappeared from our society. That charity and hospitality are things of the past. What I saw today also sensitizes me to situations where I can be helpful. It reminds me to pay attention to those around me who might need assistance or support. It helps me to remember that no good deed is small. It aids me in focusing on others and not to be so self-centered. It reminds me to look for opportunities to “live generously and graciously toward others, the way God lives toward (me)” (Matthew 5:48, The Message). I drive the streets and highways around Atlanta with hardly a thought about being feet- sometime inches- away from several thousand pound vehicles traveling at a very high speed. Even when I walk on the sidewalks near my home I am virtually oblivious to the fact that automobiles are flying past without notice. The slightest turn of the steering wheel or a momentary distraction could be deadly. Without even thinking about it I am trusting my life to unknown people. Is this faith or insanity? Hundreds of years ago men and women, along with their families, braved the dangerous open seas making their way to the New World. Many of them were seeking freedom from oppression or poverty. They believed America would offer them the opportunity for a better life. Many modern day migrants follow a similar path. What motivated them to pursue such a remote possibility? Was it faith or insanity? Was it faith or insanity? In ancient times Moses accepted the task of leading millions of Israelites from the captivity in Egypt. They had minimal resources and the journey presented monumental challenges. The early followers of Jesus were persecuted beyond our understanding but they remained true to the beliefs and bravely spread the Good News. Martin Luther, John Calvin, John Wesley and countless other were passionate in their efforts for religious renewal. What motivated these people? Was it faith or insanity? Faith or insanity? Sometimes they seem so similar. One writer said that “Faith is the substance of things hoped for, the evidence of things unseen” (Hebrews 11:1 KJV). One translation puts it this way: “Faith is confidence in what we hope for and assurance about what we do not see” (NIV). Some would say that faith is just a synonym for blind optimism, naivete, or wishful thinking. One definition of insanity is “something utterly foolish or unreasonable.” Another dictionary defines insanity as “extreme foolishness; folly; senselessness; foolhardiness.” For some people those terms also describe faith. An individual once told me that I was a “realistic optimist.” I am not sure what that means but if it suggests that I acknowledge what is but believe that it can be better, then I agree. That is an appropriate description of who I am. And that is a good definition of faith. I believe that faith requires you to see things as they are. Sometimes you have to recognize that “it is what it is.” Denial of reality is really insanity. Faith faces unpleasant and difficult circumstances and situations as they are but believes and works to make them better. If people act boldly because of their faith, they will often be called crazy. But there are a lot of behaviors and thought patterns that can legitimately earn you that label. So, why not live by faith and not by sight? A word is a unit of language, a sound or a combination of sounds, that functions as a principal carrier of meaning. At least that is the definition. However, there are many words that I hear which do not fulfill that purpose. Meaningless words. I know that the meaning of words can change over time. And words can have multiple meanings depending on context and a variety of other factors. But a word ought to mean something. Homer, the legendary author of The Iliad and the Odyssey said, “Words empty as the wind are best left unsaid.” I agree. Yet in everyday conversation and in the media I often wonder exactly what is the point of the word or phrase that is used. In Little Women, Louisa May Alcott said, “I like good strong words that mean something…” Me too, but daily I am bombarded with meaningless words. For example, there is a commercial for an adult beverage that claims to be “colder, crisper, and cleaner.” A drink? A financial institution claims it is “the bank of here.” Not the bank of “there.” OK. A fast food chain urges you to “Eat like you mean it.” Huh? A popular hotel chain’s tag line is “Travel should take you places.” Duh! Meaningless words. Also there are the words and expressions that we toss around without any intended purpose. “Bless your heart” certainly is not what it sounds like most of the time. Caroline Rogers, in Southern Living, says “It’s a versatile phrase that has a thousand meanings—and just as many possible responses. Southerners know that the meaning of the phrase depends on the tone in which it’s spoken, and a slight change in inflection or volume can make all the difference.” Meaningless words. Another expression used by us Southerners is “Y’all come to see us.” That is just a friendly way to say goodbye. We don’t have any expectation of the person following up and actually paying us a visit. Meaningless words. When I make a purchase at Home Depot or pay for my meal at Wendy’s drive-through window I am likely to hear “Have a good day” or more often than not it is “Have a good ‘un” as I leave. Meaningless words. The Huffington Post suggests that “Our everyday language has become littered with terms, so nondescript and ubiquitous that we barely even register their presence.” The writer goes on to list the 12 words that have been so overused they really don’t mean anything anymore: literally, unique, awesome, amazing, totally, basically, incredible, really, very, and honestly. Conversations and writings often utilize words like liberal, conservative, moderate, and progressive. The meaning of each of those words is so loaded according to the individual’s political, social, or religious position. Seventy years ago, George Orwell wrote the prophetic essay, “Politics and the English Language,” in which he noted that politicians, journalists and academics were increasingly using meaningless words and euphemisms to make “lies sound truthful and murder respectable, and… give an appearance of solidity to pure wind.” I wonder what Orwell would say today. I wonder if “Christian” is in danger of suffering the same fate. What are other meaningless words? Do you think “Christian” is becoming a meaningless word? The following was the Pastoral Prayer at that service of worship. Loving God, You are a great God and a good God. Compassion, kindness, mercy, and generosity match Your power and might. You are great and worthy of our praise. We gather in this place this morning after a week of tumult and trouble. We need respite from the anger, hostility, and harshness of our world. Our spirits are troubled by the struggles for power and control. Our hearts ache for those who are in distress and face an uncertain future. We pray for those whose names have just been mentioned in our hearing and for the persons and needs that we hold in our hearts. For all who are sick, suffering, or mourning we pray that they will feel Your great love and will be reassured that they are in Your hands and that You offer healing, help, and hope. We pray for persons whom we know only through the news media. For the accusers and the accused, the victims and the violators, the powerful and the vulnerable, the leaders and the followers, persons in places of responsibility and the common laborer. O Divine Creator, help us to realize that all are Yours and Your grace is available to everyone. Help us to understand that You call us to do what is just, to adhere to the high standards of morality that we expect from others, to show constant love and generosity to our neighbors, co-workers, family, and strangers and help not to think too highly of ourselves as we live in in community and in fellowship with You. Help us and all people everywhere to experience the grace You offer through Your Son, our Savior, Jesus Christ. Give us the will to follow His example of justice accompanied by mercy and kindness. Father God, teach us how to live with a sense of right and wrong. Encourage us and guide us in our efforts to provide equity and protection for the innocent while promoting justice and mercy for all people. Help us to show love to our fellow humans and to be loyal in our love toward You.